Scanning barcode labels, produced by reliable thermal printers enables pharmacists to automatically verify and record medication dispensing as well as check the prescription order to validate that the correct medication and dosage were dispensed. Each year over 900 million items are dispensed throughout England and Wales alone. Regardless of how many pharmaceuticals are received a certain amount of re-packaging or re-labelling is required. ERS can meet all on-demand barcode labelling needs, whether repackaging bulk products delivered to pharmacies, or printing dosage instructions for patients. ERS thermal printers and labels produce barcodes used for dispensing — those same barcodes then enable bedside medication administration. The optimal approach for maximising patient safety is to add barcoded variable data to every drug in a pharmacy. ERS Label Supplies are thoroughly tested to ensure the best print quality time after time. With sharp text and clear barcodes, labels scan quickly and reliably. Crucially, information is clearly legible for patients taking the medication. medication even with difficult applications such as labelling textured boxes, paper bags and items which are stored in the fridge. Dispensing labels should be no smaller than 35mm x 70mm so that all printable information is readable, ensuring the correct medication in the correct dosage is administered to the correct patient. Direct thermal – direct thermal paper labels is suitable for short term use, very limited resistance to marking or smudging and contact should be avoided with moisture, oil and fats. Direct Thermal Top Coated – offers a protective surface coat on one side ensuring the labels are durable against marking, resist fading in sunlight and are smudge-proof, solvent and grease resistant. Pre-printed – Allows you to have colour printed on the label as well as black print, e.g. 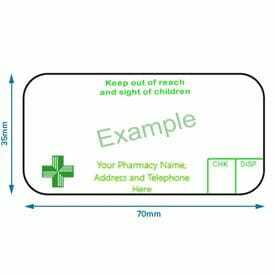 traditional green printed pharmacy cross logo, address, chemist’s details and check box for dispensed by and checked by initials. ERS Top coated Direct Thermal Blank Labels for Desktop Printers. ERS ECO HS Economy uncoated Direct Thermal Blank Labels for Desktop Printers. Includes: USB cable, power supply unit, power cable (EU, UK).